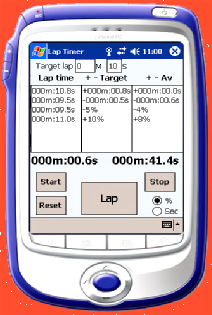 Is designed for the sports coach but is useful for anyone needing to compare lap times against targets or previous performance. This split time stopwatch package provides timers for current lap and total time elapsed. It also compares the last lap against your target time and the average so far in tenths of seconds or per cent. This stopwatch is ideal for anyone involved in timing repeating events. So you know where you are against target and what the trend is. Get a lap time stopwatch!